Osteoarthritis symptoms? 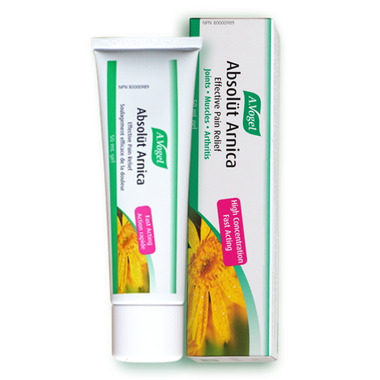 A.Vogel Arnica Gel relieves osteoarthritis pain in the knee and hand. Efficacy without the side effects of synthetic painkillers. 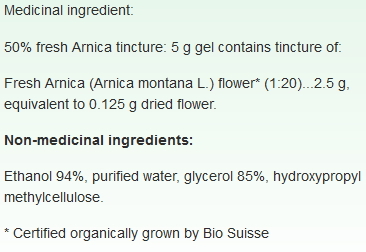 Make Arnica a part of your first aid kit! This summer, play it safe! When cycling, inline skating or enjoying other sports on wheels, make sure the whole family wears a helmet and protective gear. Always follow the rules of the road, make sure to wear bright and reflective clothing, and assume motorists don’t see you. Dosage: Adults, adolescents and children: (2 years and older): Apply sparingly to affected area 3 - 4 times daily or use as a compress. Avoid rubbing. Children application should be supervised by an adult. Caution: For external use only. Do not apply on open wounds and broken skin. Avoid contact with eyes and mucous membranes. Do not bandage. Do not apply with external heat, such as an electric heating pad, as this may result in excessive skin irritation or skin burn. Do not use if allergic to Asteraceae/ Compositae (daisy) family and in case of known allergy to any of the ingredients in the product. Consult a healthcare practitioner if symptoms persist or worsen. Do not use if safety seal is broken. Keep out of reach of children. I've been using A. Vogel AbsolÅ«t Arnica for the extreme pain of healspur, which I developed in both of my heals but MUCH worse in my left heal; due to a lower back injury with pinched nerves! This is a miracle gel! Works SO well to relieve pain and inflammation! I also use it on my knees, as needed! Works excellent for extreme muscle damage, for healing and quick relief! I tore my muscles off my pelvic bone, by crashing to the floor on a broken chair. Lilly: Excellent natural product for sore muscle, inflammation and bruises. Highly recommended. My work includes heavy lifting and twisting....this arnica gel is fantastic.It works instantly on my joints and muscles.I would recommend this brand over all the rest. This product helped relieve the arthritis pain in my finger joints like no other cream I've tried. A good buy!